DC Moore Gallery is pleased to announce Carrie Moyer: Pagan’s Rapture, the artist’s second solo exhibition with the gallery. Pagan’s Rapture is a reaffirmation of Moyer’s Pleasure Principle, providing joyful sustenance and declaring that the End Times are not near. 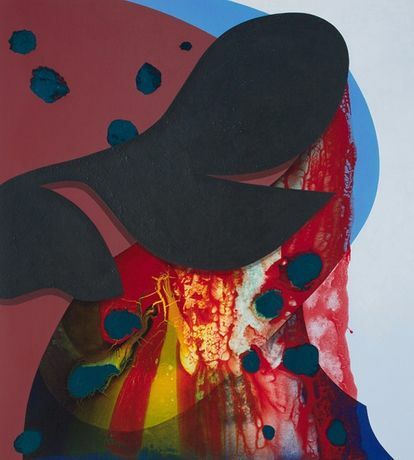 Overflowing with the seductions and materiality of color and paint, Moyer’s latest work rejects the relentlessly dour focus of the zeitgeist, proposing instead a kaleidoscopic worldview that embraces the sensual as much the rational. Playful, logo-like silhouettes of flora, fauna, body-parts, vessels, and planets utilize a collapsed history of signs. These flattened archetypes and cheeky references often perform as compositional rigging around which cascades of paint, glitter and light flow. A catalogue with an essay by Mia Locks will accompany the exhibition. Carrie Moyer: Seismic Shift, will also be on view at Mary Boone Gallery from March 1st through April 22nd at 745 Fifth Avenue, in collaboration with DC Moore Gallery.